Hi.. I am akhila.I would like to get details on pin diode based fire sensor ppt.l am living at kodungallur. And I last studied in the sreerama govt. Polytechnic. And now I am doing B Tech.I need help on this topic. Here is an ultrasensitive fire sensor that triggers an alarm when it detects a fire. Fire alarms based on thermistor have a drawback; the alarm goes on only if the fire heats the thermistor very close. In this circuit, a sensitive PIN diode is used as a fire sensor for longer range fire detection. t detects visible and infrared (IR) light in the range of 430nm - 1100nm. Then, the visible light and the IR of the fire can easily activate the sensor to activate the alarm. It also detects sparks in the network cabling and, if they persist, gives a warning alarm. It is an ideal protection device for showrooms, lockers, recording rooms, etc. The prototype of the author is shown in Fig. 1. The PIN diode BPW34 (Fig. 2) is used in the circuit as a light sensor and IR. BPW34 is a 2-pin photodiode with anode (A) and cathode (K). The end of the anode can easily be identified from the flat surface of the top view of the photodiode. A small solder point to which a thin wire is connected is the anode and the other is the cathode terminal. BPW34 is a small PIN photodiode or mini solar cell with a sensitive radiant surface that generates an open circuit voltage of 350 mV DC when exposed to a 900 nm light. It is sensitive to natural sunlight and also to firelight. Therefore, it is ideal to use as a light sensor. The photodiode BPW34 can be used in zero polarization and reverse bias states. Its resistance decreases when light falls on it. The circuit diagram of the fire sensor based on PIN diode is shown in Fig. 3. 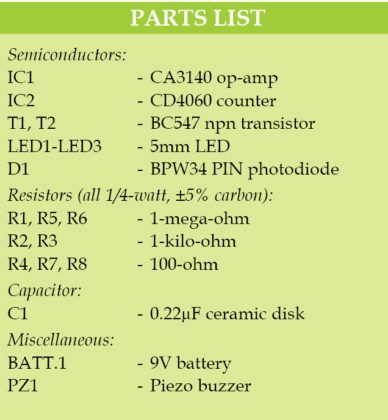 It is built around the 9V battery, PIN diode BPW34 (D1), operational amplifier CA3140 (IC1), counter CD4060 (IC2), transistors BC547 (T1 and T2), a piezoelectric buzzer (PZ1) and some other components. In the circuit, the PIN photodiode BPW34 is connected to the inverting and non-inverting inputs of the op-amp IC1 in the reverse polarized mode to feed the photocurrent at the op-amp input. CA3140 is a 4.5MHz BiMOs operational amplifier with MOSFET inputs and bipolar output. The MOSFET protected transistors with gate (PMOS) in the input circuit provide a very high input impedance, typically around 1.5T ohms. The IC requires a very low input current, as low as 10pA, to change the output state to high or low. In the circuit, IC1 is used as a transimpedance amplifier to act as a current-to-voltage converter. IC1 amplifies and converts the photo current generated in the PIN diode to the corresponding voltage at its output. 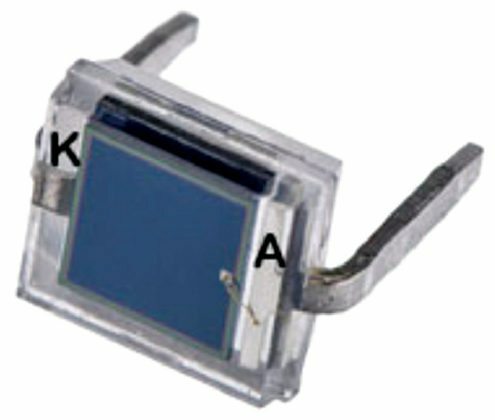 The non-inverting input is connected to the ground and the anode of the photodiode, while the inverting input receives the current photo of the PIN diode. The high-value feedback resistor R1 establishes the gain of the transimpedance amplifier since it is in inversion configuration. The non-inverting input connection to ground provides low impedance load for the photodiode, which keeps the photodiode voltage low. The photodiode works in photovoltaic mode without external bias. The operational amplifier feedback keeps the photodiode current equal to the feedback current through R1. Therefore, the input compensation voltage due to the photodiode is very low in this self-polarized photovoltaic mode. This allows a large gain without large output compensation voltage. This configuration is selected to obtain large gains in low light conditions. Normally, in ambient light conditions, the photocurrent of the PIN diode is very low; keeps the output of IC1 low. 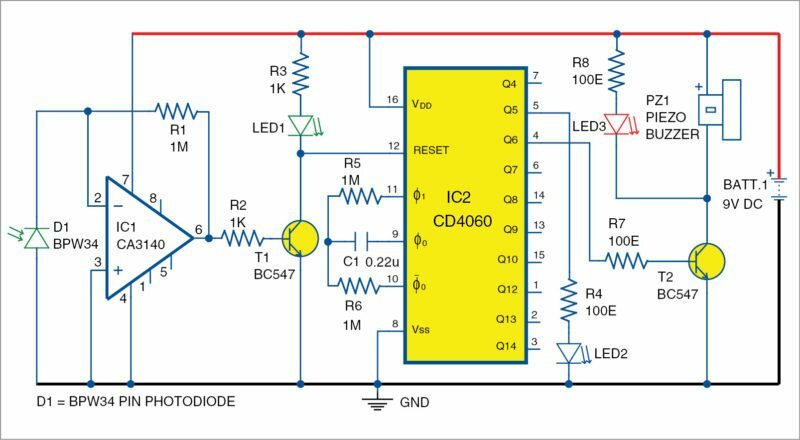 When the PIN diode detects the visible light or IR of the fire, its photocurrent increases and the transimpedance amplifier IC1 converts this current into the corresponding output voltage. The high output of IC1 activates transistor T1 and LED1 lights up. This indicates that the circuit has detected fire. When T1 drives, it carries the reset pin 12 of IC2 to the ground potential and the CD4060 starts to oscillate. IC2 is a binary counter with ten outputs that activate one by one when it oscillates due to C1 and R6. The oscillation of IC2 is indicated by the flashing of LED2. When the output Q6 (pin 4) of IC2 becomes high after 15 seconds, T2 drives and activates the piezoelectric buzzer PZ1, and the LED3 also lights up. The alarm is repeated again after 15 seconds if the fire persists.